I’ve used this procedure from my early days of teaching. I quickly discovered as a first year teacher that there would be a line of students constantly around me seeking my answer to routine questions. By having students go to classmates for help, it has made my students more responsible for finding solutions, I think. 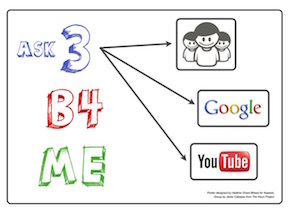 You can see that it’s no longer ask 3 peers before a teacher, but rather friend, Google and then YouTube. This poster really struck me. How true is it that we no longer have to rely on face-to-face assistance or a person being our sole conveyor of information? That there are so many answers just a Google search away! And then to take it a step further… how many people are sharing their knowledge via videos now? If I want to learn how to do something, I will see if someone has made a step by step tutorial for me to follow on YouTube first. Should we just let kids loose on these tools? No, not a first, but with guidance and training on how to do proper searches and sift through the information in order to evaluate what is reliable, they will be ready to follow this new thinking and find some really great stuff. We just can’t gloss over these important digital literacy skills. They have to be taught as authentically as different reading genres. How do you seek information and answers? I welcome your thoughts.